The Blendr iPhone app, which is also available for the iPad and iPod touch, is an intriguing experiment in geo-social networking. A common complaint about society’s increasing reliance on the Internet is that it disconnects us from our local communities. The Blendr application tries to bridge that gap by networking users based on their location, and for the user, it all happens auto-magically. 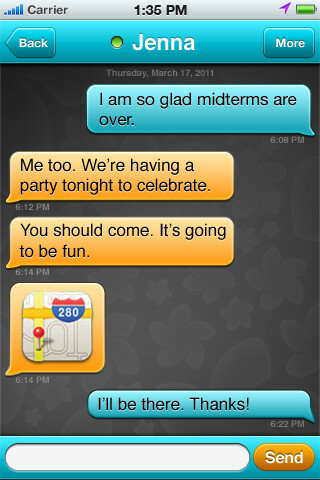 Blendr, which is a completely free app, feels a lot like an online dating service with Facebook-like elements mixed in. How well the Blendr application works for you will depend a lot on your approach to the Web. If you possess a very outgoing online personality, then Blendr is a powerful networking tool. It also works to find local hotspots for all ages, and it can help those new to the neighborhood, since they can browse users filtered by interests. Blendr is not the perfect social networking tool, but it doesn’t need to be, and it’s not trying to be something it’s not. It does what it does well, and then it fills in the blanks with complete and streamlined integration with all the big social networks, including Facebook, Twitter and Foursquare. So most of your social networking will still take place on the major networks, and you can easily move your contact profiles and other data between the services. With Blendr, the iPhone app is the most popular and accessible version, and the iPod touch version works well enough. However, while surfing the Web as we relax at home, we prefer the iPad app. With the bigger screen, Blendr is able to cram a lot more information onto the screen. This makes browsing a lot easier, and when reading a profile, it’s much easier to read and if available, you get a profile picture that is considerably larger and clearer. Like most portable social networking tools, Blendr packs a lot into a little space. Fortunately, they’ve done a great job designing the interface. All of the icons are instantly recognizable, navigation is intuitive and responsiveness is mostly excellent. Blendr is not glitch free, however. There have been several updates since the launch, and each of these updates has improved the experience, but Blendr will still behave oddly and unexpectedly at times. Finally, parents need to be aware that Blendr is an unfiltered environment, and the community, especially the younger aspects of it, tends to push the envelope more than on most social networks. iTunes doesn’t allow anyone younger than 17 to download it, and we highly recommend that you explore this service extensively before allowing younger child to use it. In addition, we should all be aware of the inherent risk of meeting people in person this way. AppSafari review of Blendr was written by Darius Reimm on September 28th, 2011 and categorized under App Store, Dating, Free, Social. Page viewed 7527 times, 2 so far today. Need help on using these apps? Please read the Help Page. The few people in your area will be shown again and again. They rarely respond. Two thirds of respondents to your profile will be men (I am a man). There are lots of fraud profiles saying they live in your city but actually they are from Russia and China. Your profile cannot be erased, the instructions to do so don’t work. You can’t blank out your profile. Other respondents included obvious transvestites and prostitutes. There is no way to report these frauds and have them removed. Avoid “Laura 99” from Sao Paulo. You will receive endless spam. Anything that might lead to something else requires expensive in-app purchases. Thanks ML. Will avoid the scam.